Learn how your students can engage in authentic culture through mobile activities. Learn what mobile learning is and why it is a growing trend in education. Learn the present status of mobile learning in modern language. Find out about many mobile learning activities that promote students’ modern language communication skills, particularly their speaking skill. If you have a Smartphone or tablet, you can participate in some activities. Discover how easy it is to implement in your classroom! This webinar will explore a variety of different activities for teaching fiction and nonfiction text with emphasis on the checkpoint C classroom. The examples will be used from my experience with Italian and Spanish levels 4&5 AP and IB. The examples and strategies are in alignment with the six shifts of the Common Core in ELA. Second language speakers are a motivated bunch. While language study is key to gaining fluency, most of us were motivated to learn by our love of the culture: the sights, sounds, tastes and sites. In this webinar, we will examine ways in which we can engage language learners in culture study that is aimed at finding a connection between their individual interests and the culture studied. We will also consider one model to allow students to self-select their area of culture study. Dozens of concrete examples (mostly in Spanish) will be shared. Are you looking for fresh ideas to help students progress in their language proficiency and gain more confidence? This workshop will demonstrate innovative and concrete examples of activities that foster increased proficiency and confidence in communicating interpersonally. You will learn about new teaching possibilities as well as discover ways to extend the activities that you already use in the classroom. The techniques are applicable to all languages at any level. In this workshop the presenter will discuss adapting ELA activities to help meet the reading needs of LOTE learners. She will highlight current ELA literacy research and discuss how it can have a positive effect on LOTE classroom practice. The presenter will also review materials available to us for classroom use, which may include: material written for native speakers, but used in a LOTE classroom, material originally written for English readers, but translated into another language, and novels written for novice learners. This webinar will showcase the best practices of building and maintaining a sequential FLES Program for our 21st century learners. Participants will be provided with examples of innovative activities for FLES class that connect to the Common Core Standards. Learn how to instill passion and excitement for FLES through ePals, Skype, iPads, Voki Classroom and more! Example will be provided for grade levels 2-6 Spanish, but may be adapted to any grade level or language. 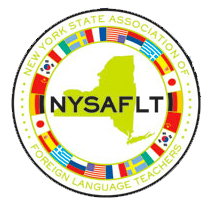 The NYSAFLT webinar series offers professional development throughout the 2013-2014 school year that addresses multiple facets of world language education.